This agreement is for a transaction where a well represented tenant leases an entire building for research and development uses. The tenant has negotiated pro-tenant modifications to nearly every section of the lease, which started out as a pro-landlord form. All one need do to spot the pro-tenant provisions is look for the words "notwithstanding the foregoing..." Exhibits included: Tenant Improvement Specifications. 1. 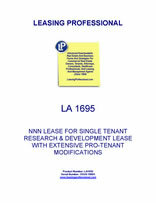 PREMISES: Landlord does hereby lease unto Tenant and Tenant does hereby hire and take from Landlord those certain Leased Premises situated in the City of ___________, County of ___________, State of ___________, described as follows: An approximately ___________ square feet two-story R&D/Office building commonly known as ____________________. NOTWITHSTANDING ANYTHING TO THE CONTRARY CONTAINED HEREIN, Tenant shall also have the exclusive right to use the entire parcel of land on which the Premises are situated, together with all appurtenances thereto and improvements thereon (collectively, the "Project"), including without limitation all parking spaces currently located thereon. Landlord warrants and represents that, as of the Commencement Date, (i) the Premises and the Project will comply with all applicable laws, rules, regulations, codes, ordinances, underwriters' requirements, covenants, conditions and restrictions ("Laws"), (ii) the Premises will be in good and clean operating condition and repair, (iii) the electrical, mechanical, HVAC, plumbing, sewer, elevator and other systems serving the Premises will be in good operating condition and repair, and (iv) the roof of the Premises will be in good condition and water tight. Landlord shall, promptly after receipt of notice from Tenant, remedy any non-compliance with such warranty at Landlord's sole cost and expense. 2. USE: To be used solely for office, sales, research, development, shipping, receiving, storage and for no other purposes whatsoever without Landlord's prior written consent which shall not be unreasonably withheld. 3. TERM: The term shall be for ten (10) years, commencing on _____________ and ending on _____________ at a rental payable in lawful money of the United States of America, which Tenant agrees to pay without deduction, setoff, or demand at _________________________________ or such place or places as may be designated in writing from time to time by Landlord, in advance, in monthly installments. NOTWITHSTANDING ANYTHING TO THE CONTRARY CONTAINED HEREIN, the Lease shall commence on the date (the "Commencement Date") that is the later of _________, or (unless waived by Tenant in writing) the date by which all of the following have occurred: (a) Landlord has substantially completed the Tenant Improvements in accordance with the Lease and this Addendum; (b) Landlord has delivered possession of the Premises to Tenant; and (c) Landlord has obtained all approvals and permits from the appropriate governmental authorities required for the legal occupancy of the Premises (unless such approvals and permits are delayed because of work being done by Tenant or the installation of Tenant's equipment). If the Commencement Date has not occurred for any reason whatsoever on or before ________, then, in addition to Tenant's other rights or remedies, Tenant may terminate the Lease by written notice to Landlord, whereupon any monies previously paid by Tenant to Landlord shall be reimbursed to Tenant. In the event the Commencement Date occurs on any date other than __________, the expiration date rent adjustment dates and similar dates shall be adjusted to reflect the actual Commencement Date. 4. BASE RENTAL: The sum of ________________________ Dollars ($______) is hereby received representing the first month's base rental due. Commencing ________ the sum of _____________________________ Dollars ($______) will be due for the pro rata share of July's base rental. The sum of ___________________________Dollars ($________) shall be due each and every month thereafter for the balance of the first year of this lease. Commencing _________ and each succeeding July the base monthly rental shall increase by 3%. 5. ADDITIONAL RENTAL: Commencing on the Lease Commencement Date and continuing throughout the Lease Term, in addition to the Base Monthly Rent, Tenant shall pay to Landlord as additional rent Tenant's proportionate share of all Building Operating Expenses including Taxes, Insurance, Maintenance, and Common Area Costs. Payment shall be made by one of the following methods: Landlord may bill to Tenant, on a periodic basis not more frequently than monthly, Tenant's proportionate share of such expenses as paid or incurred by Landlord, and Tenant shall pay such share of such expenses within thirty days after receipt of a written bill from Landlord; and/or Landlord may budget the annual projected expenses and bill to Tenant on a monthly basis, one-twelfth of the annual amount. If Landlord elects the latter of the alternatives, Landlord shall reconcile the budgeted amounts with the actual amounts on an annual basis during the first quarter of the subsequent year and bill Tenant for any additional amounts or credit Tenant any overpayments against future rental amounts. The failure to pay any additional rent as required by this lease when due shall be treated the same as a failure by Tenant to pay base monthly rent when due and Landlord shall have the same rights and remedies against Tenant as Landlord would have if Tenant failed to pay the base monthly rent when due. NOTWITHSTANDING ANYTHING TO THE CONTRARY CONTAINED HEREIN, "Building Operating Expenses" shall not include and Tenant shall in no event have any obligation to perform or to pay directly, or to reimburse Landlord for, all or any portion of the following repairs, maintenance, improvements, replacements, premiums, claims, losses, fees, charges costs and expenses (collectively "Costs"): (a) Costs occasioned by the act, omission or violation of any Law by Landlord or its agents, employees or contractors; (b) Costs occasioned by fire, acts of God, or other casualties or by the exercise of the power of eminent domain (except for the deductibles as limited in (f) below; (c) Costs to correct any construction defect in the Premises or the Project or to comply with any covenant, condition, restriction, underwriter's requirement or law applicable to the Premises or the Project on the Commencement Date; (d) Costs incurred in connection with the violation by Landlord of the terms and conditions of any lease or other agreement; (e) Costs for insurance deductibles for all risk in excess of $10,000 and for earthquake in excess of $300,000 and co-insurance payments; (f) Costs incurred in connection with the presence of any Hazardous Material, except to the extent caused by the release or emission of the Hazardous Material in question by Tenant; (h) Costs in the nature of depreciation, amortization or other expense reserves; (i) Costs to repair, replace, restore or maintain the structural portions of the Premises (including roof); (j) lease payments and Costs for machinery and equipment, such as air conditioners, elevators and the like in lieu of purchasing same and (k) compensation for any employee of Landlord or any compensation retained by Landlord or its affiliates for management and administration of the Premises or the Project in excess of the reasonable management fee which would be charged by an unaffiliated professional management service for operation of comparable projects in the vicinity. Tenant shall have the right to audit Building Operating Expenses one time per year. If the results of such audit disclose that Tenant has overpaid Building Operating Expenses by more than five percent (5%) of the accurate amount of Building Operating Expenses payable by Tenant, then Landlord shall pay the cost of such audit, which cost shall not exceed $1,000 in each instance. 6. OPTION TO EXTEND: Subject to the terms and conditions set forth below, Tenant may at its option extend the Terms of this Lease for (1) period of five (5) years. Such period is called the "Renewal Term." The Renewal Term shall be upon the same terms contained in this Lease, except that (i) Landlord shall have no obligation to provide Tenant with any Tenant Improvement Allowance in connection with the Renewal Term, (ii) the Base Rental during the Renewal Term shall be calculated as set forth below, and (iii) any reference in the Lease to the "Term" of the Lease shall be deemed to include the Renewal Term and apply thereto, unless it is expressly provided otherwise. Tenant shall have no additional extension options. A. The Base Rent during the Renewal Term shall be at ninety-five percent (95%) of the then fair market rate (defined hereinafter) for such space for a term commencing of the first day of the Renewal Term. "Market Rate" shall mean the then prevailing market rate for a comparable term commencing on the first day of the Renewal Term for tenants of comparable size and creditworthiness for comparable space in the Building and other first class R&D/Office buildings in the vicinity of the Building. In no event shall the rent be less than the rent paid during the last year of the initial term. (a) Within ten (10) business days following the Notifying Party's appraisal demand, the other party (the "Non-Notifying Party") shall either approve the appraiser selected by the Notifying Party or select a second properly qualified appraiser by giving written notice of the name, address and qualifications of such other appraiser to the Notifying Party. If the Non-Notifying Party fails to select an appraiser within such ten (10) business day period, then the Notifying Party's appraiser shall be deemed selected by both parties and no other appraiser shall be selected. If two appraisers are selected, such two appraisers shall select a third qualified appraiser within ten (10) business days following selection of the second appraiser. If the two appraisers fail to select a third qualified appraiser, then the third appraiser shall be appointed by the then presiding judge of the Superior Court of ___________ County upon application by either party. (b) If only one appraiser is selected, then that appraiser shall notify the parties in simple letter form of its determination of the Market Rate within fifteen (15) business days following his/her selection, which appraisal shall be conclusive and binding on the parties as the Market Rate. If multiple appraisers are selected, the appraisers shall meet not later than fifteen (15) business days following the selection of the last appraiser. At such meeting, the appraisers shall attempt to determine the Market Rate as of the termination date of the Lease by agreement of at least two (2) of the appraisers. If two (2) or more of the appraisers agree on the Market Rate at the initial meeting, such agreement shall be determinative and binding upon the parties and the agreeing appraisers shall, in simple letter form executed by the agreeing appraisers, forthwith notify both Landlord and Tenant of the amount set by such agreement. If multiple appraisers are selected and two (2) appraisers are unable to agree on the Market Rate, then all appraisers shall submit to Landlord and Tenant an independent appraisal of the Market Rate within twenty (20) business days following appointment of the final appraiser. The parties shall then determine the Market Rate by averaging the appraisals, provided that any high or low appraisal, differing from the middle appraisal by more than ten percent (10%) of the middle appraisal, shall be disregarded. (c) All appraisers shall be members of the American Institute of Real Estate Appraisers and shall have at least five (5) years experience appraising properties comparable to, and in the vicinity of, the Premises. If only one appraiser is selected, then each party shall pay one-half (1/2) of the fees of that appraiser. If three appraisers are selected, each party shall bear the fees of the appraiser that it selected and one-half (1/2) of the fees of the third appraiser. (d) Notwithstanding the foregoing, in no event shall the Market Rate be less than eighty-five percent (85%) of the Base Rent for the last year of the Term and the Market Rate shall be increased three percent (3%) per year during the Option Term. B. To exercise any option, Tenant must deliver a binding written notice to Landlord not sooner than ten (10) months nor later than six (6) months prior to the expiration of the initial Term of this Lease. Thereafter, the Market Rate for the Renewal Term shall be calculated pursuant to Subsection A above and Landlord shall inform Tenant of the Market Rate. If Tenant fails to timely give its notice of exercise, Tenant will be deemed to have waived its option to extend.